There are 100s of different reasons why a SMART garden room is the right choice for you. From musicians to artists, professionals to family, there is a SMART that is perfect for you – no matter who you are or how you’re planning to use it. Every SMART garden room is a product of innovation through our unique TuSC construction system; combining raw materials, traditional craftsmanship and CAD/CAM technology resulting in a high-quality product that can be installed on site in just a matter of days (yes, days! ), and which will last a lifetime. One of the benefits of TuSC is the limitless configuration options you get with every SMART, enabling you the freedom to design a room that’s a one of a kind, perfect for your requirements and completely yours; a building you will truly love. Our fully double-glazed windows and doors, available in a wide range of colours and sizes, can be placed wherever you would like them, and we also provide you with unlimited glazing, meaning you can create a room with as little or as much lighting as you need, in the style that you want, configuring them to suit your views, your room use, or just your personal preference. We know that the old adage ‘one size fits all’ just won’t do in this modern world, so we have six stunning ranges that are all so different, yet all so beautiful; from super modern, to cute and chic, (who said ‘Man Cave’ or ‘She shed’!) there truly is a range for every style, personality and person, designed specially to give you the choice whatever your need is. Make your space work for you, so from Micro to Quinto+2, there’s bound to be perfect size for you. The benefit being we can fit garden rooms into thin and long, small and square, or acres and acres. Due to our unique TuSC construction method, we are also able to deliver and install through tight spaces, such as a simple garden gate or even through your house. One of the benefits of a SMART garden room is that you’ll hardly notice we’re there, we are in and out so quickly. The construction process takes days, not weeks, and you don’t need to have any special equipment on site, just our expert craftsmen, with all the know-how you could possibly need. They will leave your garden in a matter of just a few days ready to enjoy your beautiful new SMART. 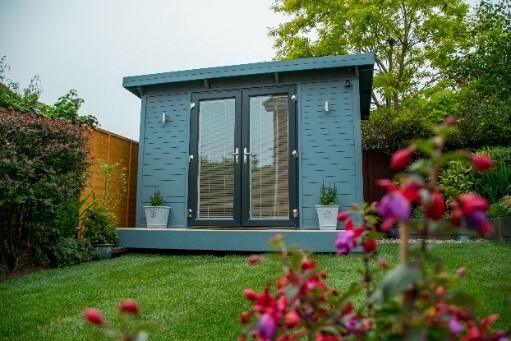 Peace of mind is a benefit that we all want, and as you would expect from the UK’s leading manufacturer of garden rooms, offices & studios, that is exactly what you get! Every SMART comes with a 10-year peace of mind structural warranty, meaning you can rest easy knowing your investment is protected and we’ll always be at the end of the phone to help you with any questions. Despite a SMART garden room being mainly construction of timber, every element is carefully chosen for minimum maintenance; from the pressure treated timbers, the 15-year colour stain, the building regulation windows and doors, to the unique no paint, no cracking interior – you truly can just sit back and enjoy your new space for many years to come without lifting a finger. The list of benefits of buying a SMART are endless, so if you’d like to know more about our beautiful buildings and just how they can change the way that you live or work, get in touch with our garden expert gurus – they know it all and are always happy to help. They can send you out a free catalogue, or arrange a completely free, no-obligation site survey, so get in touch today and start to make your dream space a reality.